Like our founder says, if painting cabinet doors and drawer fronts was a better approach, then that’s what we’d do. At Kitchen Refresh, though, we only repaint the cabinet BOXES, and then we ALWAYS manufacture and install NEW Doors and Drawer Fronts in our one-piece, solid, durable, engineered wood with an easy-to-clean Thermofoil finish. Cost: Due to the labor involved, repainting doors is almost always cost prohibitive. Time: Proper door preparation and the actual repainting results in weeks or months of additional time with your kitchen in disarray. Longevity: Hands, fingers, fingernails and jewelry take their toll on painted doors and drawers, resulting in signs of wear in a matter of months as shown in photos below. Quality: With the change in seasons, the cabinet door wood will expand and contract, and painted doors will show cracking from drying as well as splits where the frames and panels join together (our doors are a single, solid piece of engineered wood). 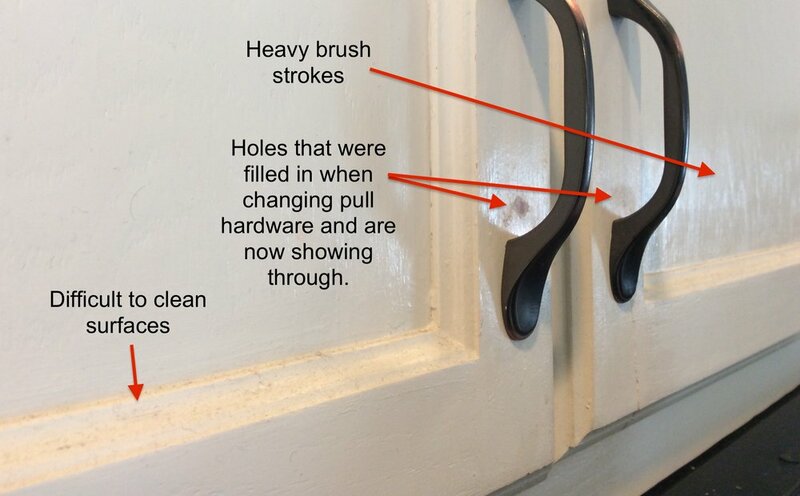 Hinges: If you have exposed hinges making your doors look busy, you’ll still have those exposed hinges after the door painting - unless you go through the very difficult, expensive and time consuming task of trying to buy new hinges and reverse engineer them to work for your doors and your cabinets. With Kitchen Refresh, all the doors receive new concealed, soft-close hinges. Hardware: Want to change up your pull hardware? If you have knobs and want to upgrade to something that gives your kitchen a stronger design presence, it’s extremely difficult to cover and fill in old knob holes without them showing through the paint (you can see that in photo examples below). Plus, it’s very difficult to relocate hardware and keep it precisely level across all your doors and drawers if you’re looking at upgrading to a different size hardware. All of our hardware is precisely located and machined using a robotic system that insures location precision. Also, we’ve “saved” at least a dozen kitchens where either the homeowner, or a hired professional, started a cabinet repaint and later gave up due to the sheer amount of time and labor involved to do the doors and drawer fronts correctly. As such, the homeowners really paid twice - once on the repaint attempt and again when we came in to complete our process. There are a myriad of typical painted doors and drawer issues: No matter how much paint you apply, your dated style door will still be a dated door. You can also see indentations that were “cut” into the drawer over time as people would grab the drawer by the base rather than by the pull because typically the pulls are too narrow, too flat and too uncomfortable for fingers to to go through; you can see paint wear along the tops of the doors where there is likely a lot of hand interaction due to the small handles, and also the common wearing of paint in the pulls where fingers, fingernails and hand jewelry collide; and, lastly, paint blemish and discoloration due to the nature of paint application. Here you see some of the common problems with a painted door: There is a tendency to apply the paint too thickly, which results in unsightly brush strokes as well as paint pooling in areas on the door; you’ll also note that a typical shaker door has ornate frames, make them excellent dirt, food and dust gatherers and difficult to clean; and, often, people will upgrade their hardware to a different size, meaning holes will need to be filled, and these are very difficult to make precisely even with the door, and because of the finger wear in those areas, will reveal themselves, just as it is visibly shown here. A painted door is more susceptible to the underlying wood cracking, creating the unsightly splitting in the wood and paint shown here. A Kitchen Refresh door is a single, solid piece of engineered wood - no cracking! Because doors are made up of 5 pieces of wood - the top and bottom and two side frame pieces, as well as the center panel insert - the wood expands and contracts , particularly between the panel and the frame, causing the paint to split along the edge where those two meet. This splitting results in chipping and flaking, as well dirt, food, and cleaning rag threads getting caught in those areas. As above, a Kitchen Refresh door is a single, solid piece of engineered wood - no cracking! And our clients often comment how easy they are to clean! Hands, fingers, fingernails and hand jewelry take their toll on a painted door and drawer front in a matter of months, particularly on the doors and drawer fronts that see the heaviest use - your silverware drawer and your go-to water glass cabinet. With Kitchen Refresh, we manufacture all NEW doors and drawer fronts with a durable Thermofoil finish to protect against that daily wear.